Every summer we are reminded of the danger of leaving a child unattended in a parked car. 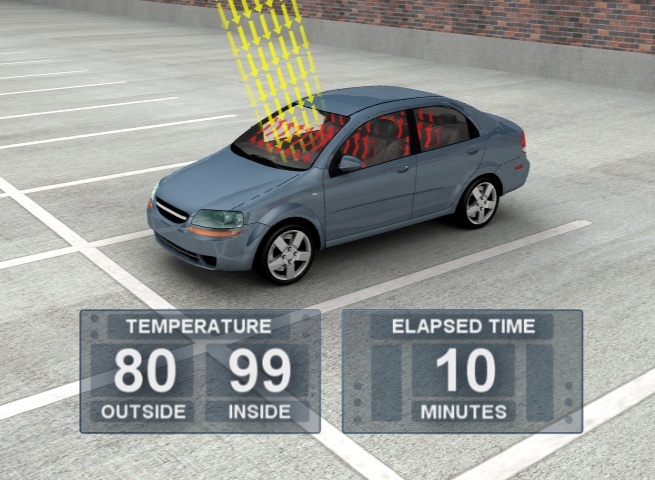 The temperature inside a parked car on a 90 degree day can reach 119 degrees in 20 minutes and 133 degrees after an hour. It is heart-breaking to hear of accounts where adults have forgotten that there was a child in the back seat, and the child died because of the extreme heat. Some say that parents should get in the habit of opening their rear doors every time they leave the vehicle. Others suggest keeping a stuffed animal in the front seat, or your purse or cell phone in the back seat—anything to remind you that there is a small child in the car. Parents should also inform their daycare workers to call them any time their child doesn’t show up on time. These important reminders are necessary because even the best parents and babysitters can become distracted and forget that they have a child in the car with them. Another important thing that we need to be reminded of is that Jesus died to save us. The communion that Christians take on Sunday is a much-needed reminder of this all-important truth. “And he took bread, gave thanks and broke it, and gave it to them, saying, ‘This is my body given for you; do this in remembrance of me.” In the same way, after the supper he took the cup, saying, ‘This cup is the new covenant in my blood, which is poured out for you.”–Luke 22:19-20. This entry was posted in Christian Living, Communion Meditations and tagged child in hot car, danger of hot car, illustration, Luke 22:19-20, parked car heats up, remember child in car. Bookmark the permalink.